In the Lutheran Book of Worship, the marriage rite states: “Because of sin, our age-old rebellion, the gladness of marriage can be overcast and the gift of the family can become a burden” (LBW, p. 203). This is a sad and tragic reality, that the gladness of marriage can be shadowed and the gift of spouse, children, and loved ones can be burdensome. An unexpected pregnancy, the daily trials of life together, the needed care for an elderly and infirmed parent can all be seen as difficulties to be overcome, a burden to be borne in life. Both Mary and her cousin, Elizabeth, had reason to view their pregnancies as burdens. Elizabeth was “barren” and she and Zechariah were “advanced in years”—having no children. But an angel visited and proclaimed that they would have a son, to be named John. For anyone having chased their grandchildren around the house, it would not be surprising had Elizabeth and Zechariah considered this news more bad than good! Mary, having conceived before marriage, might also have had reason to wonder why God chose to act in this way. Still, both received the news with gladness. 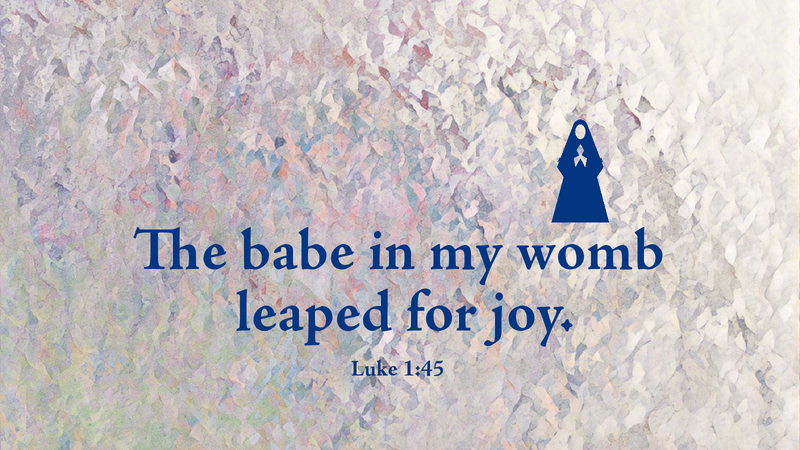 When Mary visited Elizabeth, the baby, John, in her womb, leaped for joy at the presence of Jesus, unborn, awaiting birth at Bethlehem. Two of the greatest challenges in life—dealing with expected trials at advanced age and a pregnancy outside of wedlock—were received by Mary and Elizabeth, not with dread or fear or despair, but with gladness and joy. We each face such unexpected twists and turns in life. We receive news that challenges us, disturbs us, turns our world upside down, for a time. The birth of Jesus, God with us, and His resurrection from death to “be with us always, even to the close of the age,” provides us day by day and moment by moment with hope to face the future with courage and confidence, not because of who we are, but because Jesus’ presence in our lives turns burden into blessing, shadow into light, and sorrow into joy! Life is a gift—whenever and however it comes! The Lord lives to give life, and life that is abundant and full. May our hearts leap with joy every day, as we experience and celebrate the gift of life! Prayer: Lord God, let the challenges of life be, not a burden, but a blessing—received with joy and hope, through Jesus our Savior. Amen. Response: Make a phone call or send a text or email to someone for whom life is a burden today, and share with them a little light and encouragement. Today’s devotion was written by Rev. David Wendel, Assistant to the Bishop for Ministry and Ecumenism.